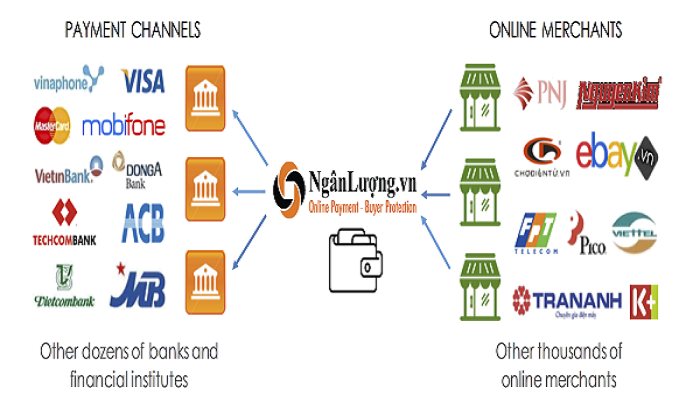 Nganluong.vn is the pioneer and leading online payment gateway in Vietnam, in terms of products and services, market share coverage and payment volume. Developed by Nexttech Group (formerly PeaceSoft Group) since 2009, Ngan Luong allows individuals and businesses to send and receive money on the Internet quickly, safely and conveniently. Ngan Luong.vn is operated under the e-wallet model, whereby users can register their personal or business accounts with three main functions: Recharge, Payment and Transfer. All transactions are made online via ATM, Visa, Master, JCB, Amex, Internet Banking, QR-Pay ... and other convenient forms. Ngan Luong.vn has built up an advanced system of direct links with nearly 40 financial and telecommunication organizations in Vietnam and internationally, including: Paypal, Visa / Master, CyberSource, Sacombank, VPBank, Shinhan Bank ANB, Eximbank, Maritime Bank, VIB, HSBC, Citibank, Techcombank, Seabank, Standard Chartered, TP Bank, SCB, NAB, Namibank, OCB BIDV, FE CREDIT, VinaPhone, MobiFone, Viettel ... thus providing full online payment solutions that offer a wide range of payment channels for customers. NganLuong.vn is proudly the first e-wallet and payment gateway in Vietnam granted a license issued by the State Bank with No. 2608 / QD-NHNN on online payment, helping to ensure the legal prestige for customers when making transactions on NganLuong.vn; Ngan Luong is ranked in the top 10 outstanding payment solutions in Vietnam by the famous Forbes magazine with a total of 15 million transactions, the total value of transactions up to $ 200 million and the number of users reached 1 , 3 million; "The most popular e-wallet and payment gateway" in 2009 and 2010 by the Vietnam Software Association and the Ministry of Information and Communications, the only Sao Khue Award for "Best E-wallet". With millions of users, hundreds of thousands of wallet accounts and estimated payout traffic accounting for more than 50% of the market share, Nganluong has really brought in a super-free payment channel, giving customers a shopping experience which is easier, simpler and more convenient, and contributes to revenue growth for affiliates.